Vine mealybugs (VMB) can deposit copious amounts of honeydew on grape bunches. Honeydew serves as a substrate for black sooty mold. VMB can infest bunches directly, making the grapes unfit for consumption. VMB can transmit grape viruses. 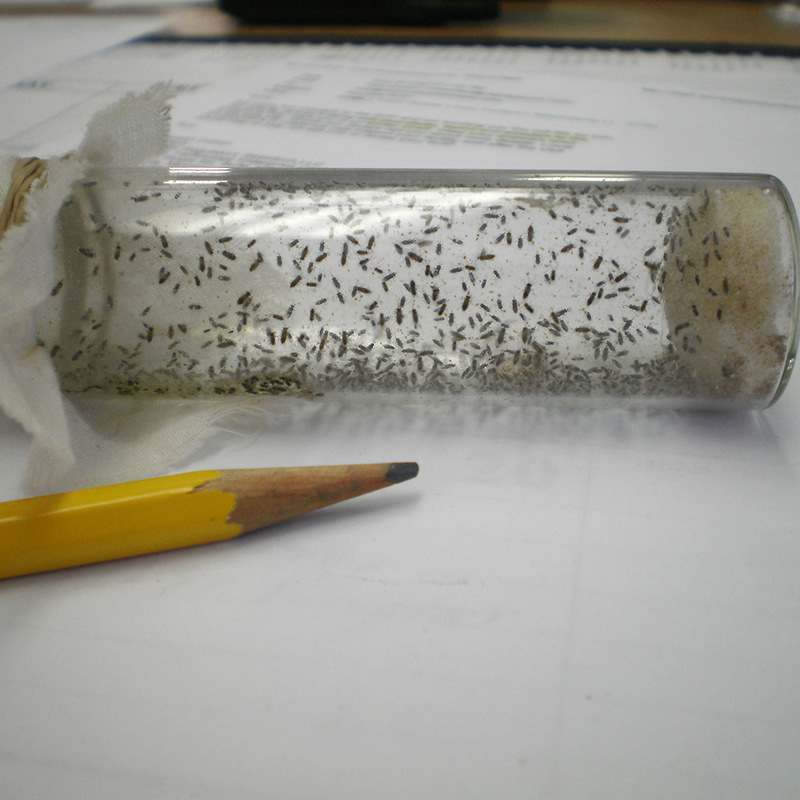 After being contacted by concerned grape growers who realized the need to incorporate biological control into their pest control program, Associates began rearing Anagyrus pseudococci wasps in 2010. This beneficial wasp complements Associates’ Cryptolaemus beetles which are the industry standard for mealybug control in numerous crops. The use of these two beneficials gives grape growers an effective “one-two” punch to combat Vine mealybug in both low and high VMB populations. 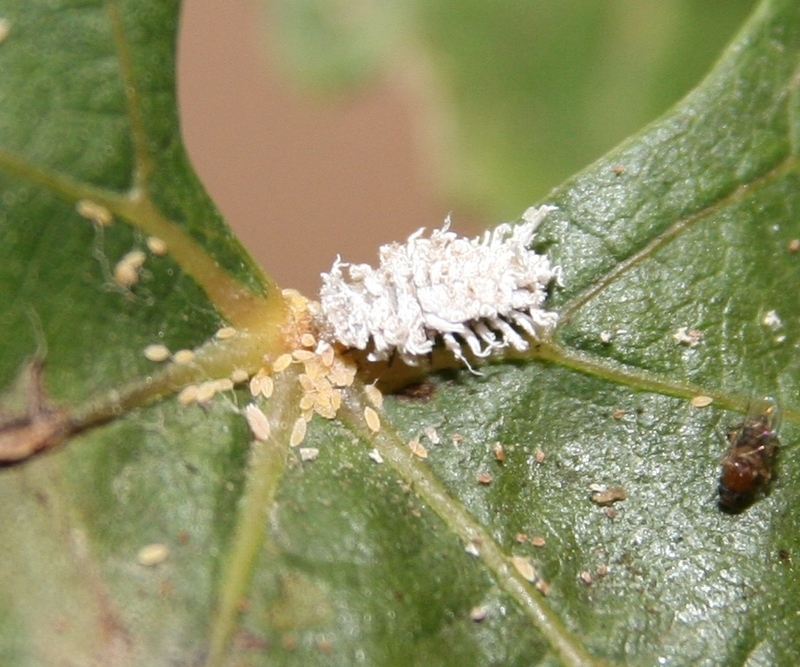 Anagyrus pseudococci can provide up to 90% parasitism of Vine mealybug at some sites in the San Joaquin Valley, however, effective control is not usually achieved with wasps alone. This beneficial parasite is active late in the grape growing season and can reduce Vine mealybug populations before the pest moves to the lower part of the trunk. We suggest that combining the two biological control options of Cryptolaemus beetles and Anagyrus wasps with Mating Disruption in your vineyard will allow you to decrease your dependence on harsh chemical insecticides and move you towards your sustainable farming goals. Associates Insectary has been producing beneficial organisms for 90 years and is using that experience to help meet grape growers’ needs for sustainable solutions to pests problems. 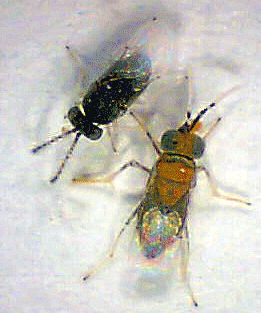 Cryptolaemus montrouzieri beetles and Anagyrus pseudococci wasps complement each other. The predatory beetle feasts on eggs and younger stages when VMB levels are high, while the wasp searches for 3rd instar juveniles when populations are low. The young beetles can continue to feed on mealybugs even in the presence of ants which attack the wasps and destroy their effectiveness. Thus the two natural enemies may co-exist in the same habitat and both contribute to mealybug suppression. A truly integrated Vine mealybug control program is further enhanced with the use of Mating Disruption. The synergy of these three tools increases the sustainability of VMB control in vineyards. Best Use Guidelines: Young Cryptolaemus larvae prefer to feed on mealybug eggs and younger stages of mealybug. 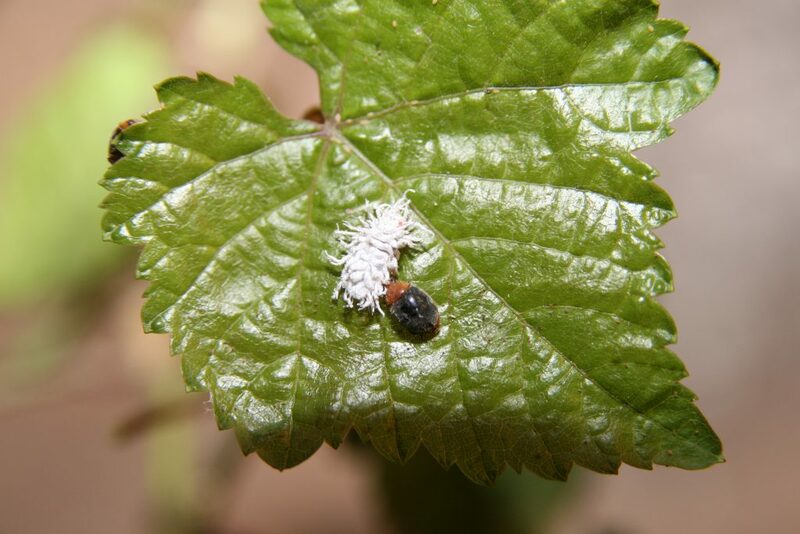 When no Vine mealybugs are available, Cryptolaemus will also feed on other species of mealybugs and other soft bodied insects. Mealybug Destroyer larvae mimic mealybugs in appearance and odor, which allows them to feast on VMB with little disturbance from protective ants. Cryptolaemus reproduce quickly, laying 400 eggs per female. Note: Only 1 to 2 releases per season are typically needed for VMB control. Release Timing: First releases should be in early spring as soon as VMB egg masses are observed. Mealybug Destroyer beetles should be released at dusk where egg masses are found. Release Rates: Range from 500 to 2,000 adults per acre – depending on Vine mealybug activity. Shipping Info: Cryptolaemus are shipped as adults in quantities of up to 500 per tube. Overnight rush shipping insures their freshness. Beetles should be released at dusk on the day of their arrival. Pricing: A shipment of 15,000 beetles, with bulk-tiered pricing, will cover up to 30 acres and cost about $40 per acre. Unit pricing varies based on quantity ordered. Email billing@AssociatesInsectary.com for a formal quote. Best Use Guidelines: Adult VMB’s are ignored by Anagyrus, they prefer to only attack 3rd to 4th stage instars, Anagyrus are very good at finding scattered pockets of VMB in vineyards, but high ant activity severely reduce its’ effectiveness. Anagyrus reproduce slowly. Females lay only 45 eggs, yielding poor results with high pest levels. Note: 4 to 8 releases are typically required per season for VMB control. Release Timing: First releases begin in the spring (April-May) as soon as 2nd stage juveniles are first observed during scouting and continue as needed through August. Release wasps when temps are low. Release Rates: Growers typically release Anagyrus every two weeks at a rate of 200-250 per acre/release. However, Anagyrus release rates vary greatly by region and depending on abundance of ant activity. Shipping Info: Anagyrus are shipped as adult female and male wasps to promote mating. Pricing: A shipment of 5,000 wasps will cover up to 20 acres per release and cost about $50 per acre with 4 to 8 releases needed during the season.